I LOVE pork belly! It is so unhealthy though but I still looove it. It is one of the meats that I really like. This is a classic roast pork belly with crispy skin. It is fairly simple, utilising simple spices and seasonings. Wash the pork belly and remove any hair on the rind/skin, pat dry with paper towel. Prick/poke the rind as many holes as possible, using the sharp tip of a knife. It is an important step to make the rind crispy. Then make a few slits on the meat for better absorption of seasoning. Coat the rind and the meat with cooking wine. Only marinate the meat part with above marinade. Do not put any marinade on the skin/rind. Air dry the whole pork belly openly in the fridge with the rind facing upward. For best result, leave the pork to marinade for at least 1 day. This will produce a better flavour and a crispier skin. Pre-heat oven to 230 degree celcius. Coat at least 1 inch thickness of coarse salt on the rind. This is to dry the skin while it is baking to achieve a crispy effect. Carefully wrap the pork belly with aluminum foil and place in a roasting tray, making sure the height of the foil is at least 1 inch higher from the skin+salt. Bake the pork belly at the center of the oven for around 50 minutes. Remove the foil and salt on the skin of the pork. Adjust the oven to grill and reduce the heat to 210 degree celcius. 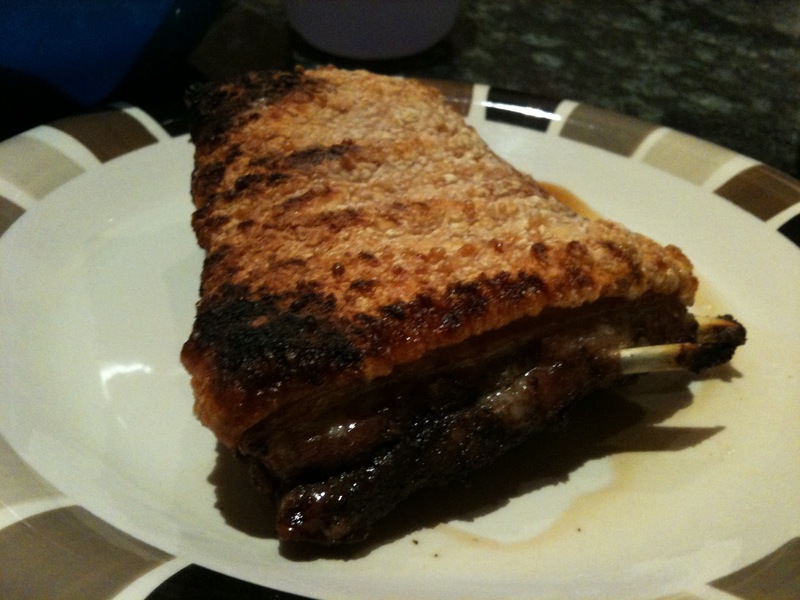 Put the pork belly on the top rack of the oven to grill for another 20 minutes or until the rind/skin is crispy. Remove from the oven and let it rest before serving. I marinated the pork for only a few hours and therefore, it is not as flavoursome as I want it to be. So if you are making them, remember to marinate the night before you roast them. Make this! It is so easy and taste so gooood! 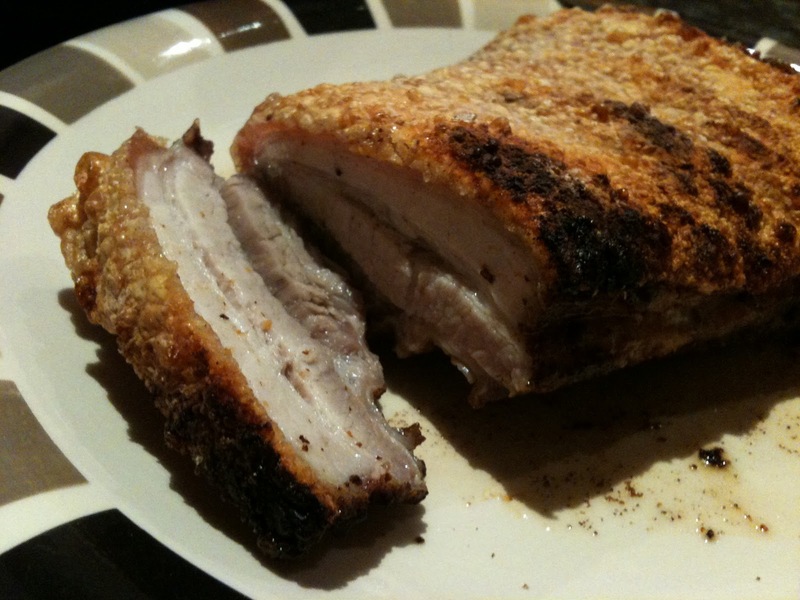 I love roasted pork belly, they are my fave but never made any myself, heard it was rather difficult and messy with all the pork fat coming up during the roasting process. Thanks for sharing this, they looks yummy with the crispy skin. I absolutely LOVE pork belly. It’s actually really easy to make. I think the key is to leave the pork to marinade for as long as you can (overnight). I don’t think it’s messy. There are other dishes which are even messier. But it can really make the whole place smell! I live in a small apartment, when I cooked that, the whole place smell.